Jets flying home to Winnipeg? It’s true – the Winnipeg Jets are being wished back into existence, remarkably after being exported to Arizona as a potential “cash cow” (or, er, coyote). So much for that idea. How much was the Phoenix Coyotes’ bankruptcy price, $140 million? And according to The Toronto Star, the club is now a further $20 million in the hole after this season. We give you Gary Bettman ladies and gentlemen – a man with a dream. Incredibly, the idea that Canuck teams are too small time to make good money, is now being shunned by pundits because Canadian locales are surely better off than struggling post-GFC American cities, as Randy Turner explained in The National Post this week. And there’s the moral of the story. How can anyone, in any pro sport, seriously contemplate relocating a popular team again for the sake of a few bucks? It’s nuts. It doesn’t matter which way you slice it – fancy new TV deal, the promise of more bobble head sales, or potentially robust attendance figures – loyal fans always deserve to keep their team, and in the end, will stand by them. When the chips are down, do the ambitious movers and shakers of business really believe fans in the desert, on the beach or cruising the bayou will really be enamored with hockey – on ice? These people have football, basketball and baseball. They prefer ice in their lemonade to ice in their arenas. It’s just common sense. Hey, nobody’s disrespecting the fans that do support the Phoenix Coyotes, or the Nashville Predators for that matter. In fact, we tip our inflatable hockey hats to you. But the way in which the Winnipeg-Phoenix saga has played out needs to be a lesson for all: tradition and passion count for more than the bottom line (at least in Any Town, North America). As long as us – the fans – are happy, who cares about the league’s desire for expanding markets? Following a sports team isn’t a game for us, as it is for many owners. It’s an emotional relationship, in which nobody wants their heart broken – especially not for a few dudes wanting a better lining in their pockets. Hopefully the potential re-relocation of the Jets reinforces this message. And while we’re at it, maybe there’ll be some recognition that you don’t mess with a classic sports brand. 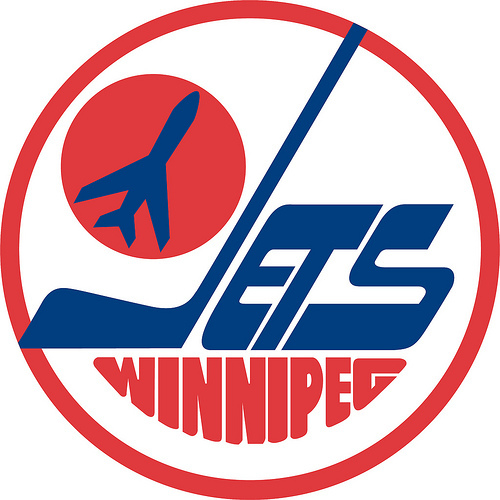 The Jets logo, after all, was – and maybe is – one of the best to ever grace a rink.